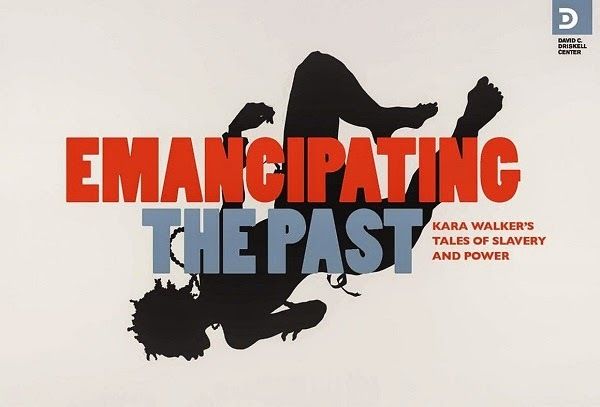 The David C. Driskell Center at the University of Maryland is proud to present Emancipating the Past: Kara Walker’s Tale of Slavery and Power. The exhibition features about 60 works; along with Walker’s signature black paper cutout silhouettes, an array of prints, a wall installation, and a video will also be showcased. Kara Walker is one of the most successful and widely known contemporary African American artists today, remarkable for her radical engagement with issues of race, gender, and sexuality, and for the media with which she pursues her studies. Her work pries apart and examines the injustices that African Americans have faced throughout the long and tumultuous history of the United States. She explores power relationships in American society through the vehicle of representations of slavery, race, sexuality, violence, and gender set in the antebellum South. The works, which are inventive and painful, but also satirical and humorous, were selected for the show to display the range of approaches Walker has taken in exploring the legacy of slavery for contemporary American identity. In an early interview with the Museum of Modern Art in 1999, Walker speaks frankly about some of the motivations for her subject matter and aesthetic: “[When I moved to Georgia] I became black in more senses than just the kind of multicultural acceptance that I grew up with in California. Blackness became a very loaded subject, a very loaded thing to be—all about forbidden passions and desires, and all about a history that’s still living, very present.” Emancipating the Past, organized by the Jordan Schnitzer Museum of Art, University of Oregon, Eugene, from the Portland, Oregon-based collection of Jordan D. Schnitzer, is illuminated by both deep personal experience and rigorously researched history. This multifaceted informing of her work makes her pieces both immediate and overarching, both personal and historical, both accessible and unthinkable. In conjunction with the exhibition, the Driskell Center presents a panel discussion on Thursday, March 26th, 2015 from 3-6PM. Participants in the discussion, titled “Emancipating the Past: Unchain the Future,” include Dr. Michele Wallace, Professor at the Graduate Center, CUNY; Ira Berlin, Distinguished University Professor of History, La Marr Jurelle Bruce, Assistant Professor in the Department of American Studies, and Paul Landau, Professor of History, all at the University of Maryland, College Park; and Schwanda Rountree, attorney, art collector, and art consultant. Panelists will explore Kara Walker’s imagery as a point of departure for discussing issues of slavery, race, sexuality, violence, and gender, among others. Additional details will follow. Programs related to the exhibition are organized in collaboration with the University of Maryland’s Consortium on Race, Gender, and Ethnicity. Kara Walker was artistically inspired at a young age by her father, artist Larry Walker. She received her Bachelor of Fine Arts in Painting and Printmaking from the Atlanta College of Art in 1991, and her Master of Fine Arts from the Rhode Island School of Design in 1994. Walker’s artwork has exhibited nationally and internationally at many prestigious museums such as the Metropolitan Museum of Art and The Studio Museum in Harlem, both in NY, in 2006 and 2003 respectively; The Fabric Workshop and Museum, Philadelphia, PA, 2004; and the San Francisco Museum of Modern Art, CA, 1997, among others. In 2002, she was chosen to represent the United States in the São Paulo Biennial in Brazil.